How many times have you felt guilty and blamed yourself for the situation you found yourself in? That’s what it feels like, isn’t it? That you suddenly found yourself in a situation of abuse? The relationship began normally, wonderfully. You were both in love. You loved being together, you planned a future together. Maybe you were a bit naïve and ignored some potential red flags, thinking that they weren’t so bad or that things would change as the relationship deepened. But they didn’t change, and things got worse. As time went on, you felt yourself disappearing in the relationship, even though you were strong and intelligent. Even though you had opinions of your own, it felt like what you thought didn’t really matter, because he somehow always got his own way. Did what he wanted to do…or not. And you felt guilty. It felt like the things that were wrong in the relationship were somehow your fault. And it was your responsibility to fix them. You tried. Over and over again, you tried. Couples counselling. Reading books together. Trying to set healthy boundaries. Having the difficult conversations. But nothing changed. Then you could take no more…and so you left. You walked away from all you’d built, and you felt like you’d failed. Big time. You had been responsible for the health of your relationship and it had failed and so it was your fault. It takes a long time to realise that the health of a relationship is the responsibility of both people involved. At first, your head acknowledges this truth, but it takes a significantly longer time for your heart to fully accept that you are not solely responsible for whether the relationship survived or thrived. You carry guilt and shame. You feel like a failure. But you can see it another way. The most helpful thing I did with my own abuse/leaving/divorce story was to own it. I’d spent many years trying to hide from that fact that this was now a big part of my life story. Cognitively, I knew what had happened, but emotionally I was still in denial. Until I read Brene Brown’s words: “The most courageous thing we can do is own our story and love ourselves through the process.” So, I owned my abuse/leaving/divorce story. I took it to myself. I no longer tried to deny it to myself or wish it hadn’t happened. It had happened. It had happened to me. It was my story. And as soon as I owned it as mine, all the shame and guilt I’d been carrying disappeared. I didn’t deserve to be in an abusive relationship. I wasn’t responsible for the way my ex-husband treated me. But I was responsible for the way I now lived my life. And I’m doing that in freedom and fulfilment. Because this story is my story. The abuse shaped my life, but it doesn’t define it. The abuse buried my dreams, but now I’m recovering them. The abuse birthed in me a superpower, now uncovered, with which I face life and forge my new future. Are you carrying guilt and shame and a deep sense of responsibility for the abuse you experienced? There is a way to come to grips with the difficult parts of your life story and then leave the guilt and shame behind. That’s why I developed The Sassy Women’s Project, to assist women on their journey from abuse survivor to thriver. This 12-month program includes The Six Pillars of Thriving, the foundational steps for rebuilding life – release, fulfilment, intuitive genius, collaboration, celebration and transformation, as well as monthly coaching calls. To find out more about this program, and if it is a good fit for you, leave your details below. 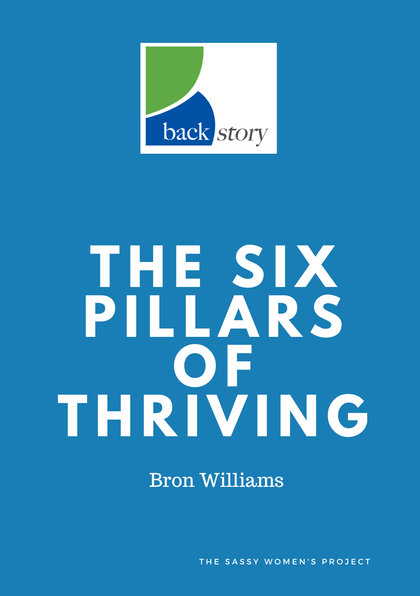 I’ll send you a free PDF of The Six Pillars and details about how to schedule a complementary discovery call. You can be powered by your past.